What Happens inside a Scanner? Most popular scanners now on the market have very few moving parts. Plus you don’t really have to know how your scanner does its job in order to use one. The scanner’s sensor (an array of photosensitive cells) moves one line across the material you’re scanning. (In some scanners, the material moves past a fixed sensor; this concept gets important pretty soon.) The sensor is paired with a strong light source that illuminates whatever you’re scanning. As the sensor moves past the original, each cell sends a level of current corresponding to one dot (a pixel) of the reflected light from the material. For example, scanning the white part of a printed page results in a far different signal from scanning the black text on the same page. 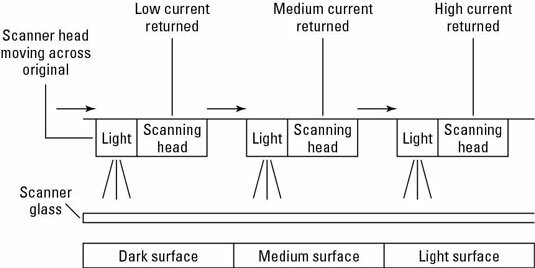 Your scanner’s electronic brain (tiny as it is) collects all the signals from each pixel, resulting in a digital picture of one line of the original. The scanner sends the data from the scanned line to your PC. The sensor (or the material) advances one line, and the entire process begins again at Step 1. You can compare this process with taking a digital photograph of each line of your document and then laboriously pasting those separate images together in an image editing program. Luckily, you don’t have to do the hard work: Your PC collects each line sent by the scanner and builds the document for you, usually while you watch. Technology is grand that way.